You are at:Home»Chow»Coming soon: gourmet Navy chow. Really. Hundreds of exhibitors came to show their wares at the 2014 Sea Air Space expo near Washington, D.C., but none drew a crowd as much as Naval Supply Systems Command’s booth around lunchtime. Smiling attendees milled around with small plates of seared snapper and field greens prepared by Navy culinary specialists, getting a small taste of the Navy’s plans for meals underway. Sailors underway are a captive audience for culinary specialists, but they can still go the ship’s store or the geedunk machine when they’re hungry. King said the idea is to draw them to the mess by cooking fresh, tasty dishes they recognize, like steak and shrimp. 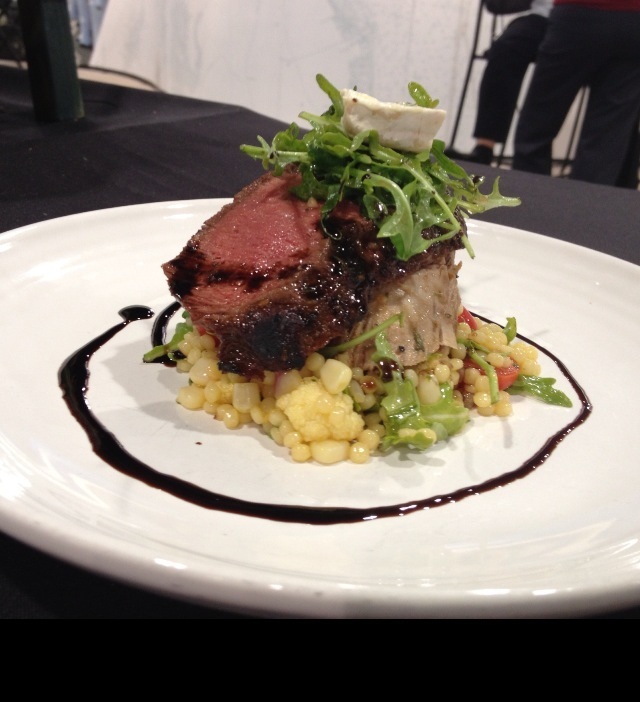 One mouth-watering example: Culinary Specialist 1st Class (SW) Matthew Susienka’s pan-seared red snapper with candied pecans and frisée salad. It isn’t included on a ship’s meal plan, but it could be. “We can absolutely do this underway. We have all of the ingredients to do it underway,” Susienka said. 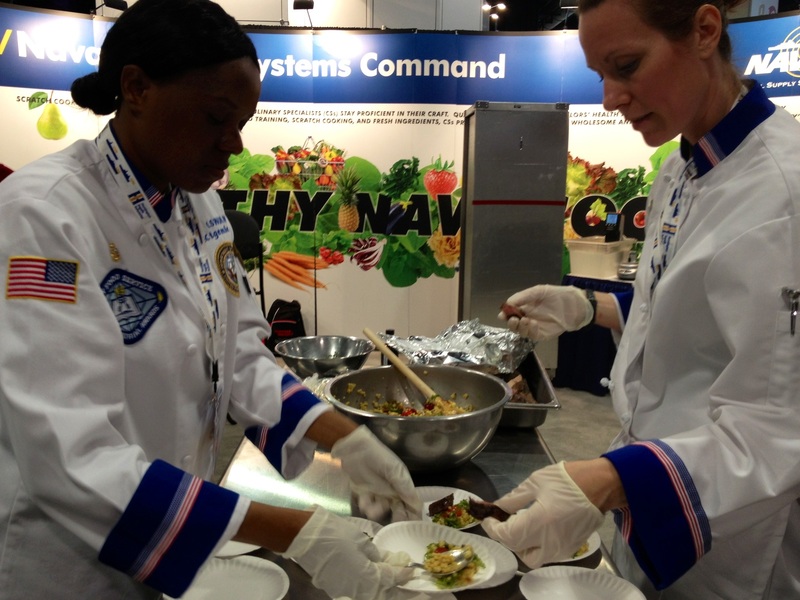 This is part of the Navy’s shift away from “advanced food products” — packaged meals you can heat up and serve, like school lunches or airplane meals — toward fresher, more nutritious ingredients. NAVSUP plans to kick the underway menus up a notch. As it turns out, purchasing, storing and refrigerating fresh foods isn’t much more complicated or expensive than buying processed foods instead. “Advanced food products actually decreased our space size. Those boxes are more bulky and it took up more space,” King said. And thanks to technology, the Navy has blankets they can lay over food supplies that absorb food-spoiling ethylene gas from the air, extending freshness for 21 days. King also described a light system that sanitizes the air in storage spaces, to keep bacteria and fungus at bay for longer periods of time. As far as cost goes, King said, fresh ingredients are cheaper than packaged foods, and the health benefits to the sailor come out in the cost of medical care later on. I was a former CS2, I got out of the Navy because the mess had gone to processed foods, and there was no skill involved in the cooking anymore, and I felt as if the cooks were just getting “dumbed down”. This could add a sense of pride to the work place again. We should have never gone away from real cooking work in the galley. Seems like all we did was throw a premade pan in the oven and clean. We cleaned so much there we didn’t need FSA’s. Now if they can actually send CS’s to a real culinary school like the Coast Guard does, I think we can work this all out. I wish I could be apart of this change. Good luck CS’s still in the field. Make the other sailors want to eat at the mess! That’s a great idea! Hope it gets there soon! Why send them to School when Culinary Schools are pumping people out. Recruit straight from the schools of people graduating from school already Here at Art Institute in San Diego you could get many. Give them advanced paygrades based on degree and grades. The Navy has come a long way. We had the worst, from that horrible breaded veal to hot dog stew once….but the coconut shrimp to the pepper steak were memorable and tasty. I hope though that mid-rats have improved – used to be a bucket of boiled cold hot dogs, a can of mustard and a stale loaf of bread sitting out. It is about time. The stuff they serve on a ship is a joke. This would be a welcomed changed for the better. Finally so one in office with a brain and the pulse of the crew. All I can say is WOW!!! After sailing aboard 8 differant Subs over 20 years I think I complained once. And that was my french toast wasn’t left in the egg wash long enough so it was pretty much toast. Sub sailors eat just fine in my Book. Hats off to the Cooks, I mean CS’s. Keep it coming. The USN has finally admitted that it’s culinary standards fall below those of comparitive allied navies. This deficit is evident by the reactions of USN sailors who ‘cross-deck’ to other allied ships for short periods. The USN has taken onboard formal advise from the Brits, the Canadians, the Australians and even the Kiwis(!!) and is now thankfully making this move. Congrats! You mean they will go back to pork adobo, chicken adobo, rabbit adobo? No thanks. I can’t tell you how many times our ship (USS Enterprise) had adobo and rice for dinner. I will take a canned meal any day.